French President Jacques Chirac has said referring Iran to the UN Security Council is not the best way to resolve a crisis over its nuclear programme. 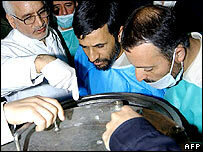 The US is leading calls for sanctions to be imposed on Iran if it refuses to suspend uranium enrichment. Iran denies US accusations that it is trying to build nuclear weapons. Tehran maintains that its nuclear programme is solely for power generation. The US is pressing for sanctions against Iran, but some European countries are hesitant to do so, preferring to offer Iran incentives to halt enrichment. The BBC's Caroline Wyatt in Paris says that after the relative success of French international diplomacy during the recent crisis in Lebanon, Mr Chirac appears keen to continue to offer the world French leadership on Iran as well, another country with which France has long historical ties. Mr Chirac said that he believed that there was still potential for fruitful dialogue between Iran and the six nations currently involved in the Iran nuclear issue - the US, UK, France, Germany, Russia and China. "I am not pessimistic," he said. "I think that Iran is a great nation and that we can find solutions through dialogue." Mr Chirac said he had never noticed that sanctions had been effective, although he said that he was not ruling out using them if necessary. Instead he suggested that the way forward was for negotiations to begin without any preconditions and for each side to make concessions once they are under way. This is the first time that a European leader has made clear that Iran's suspension of uranium enrichment is not a precondition for opening talks, but could come during the negotiations, our correspondent says. Iran has ruled out accepting any preconditions for talks and dismissed calls to suspend uranium enrichment, ignoring a 31 August UN Security Council deadline to do so. Meanwhile the head of the UN's nuclear agency, the International Atomic Energy Agency (IAEA), has called for Iran and the six world powers to begin talks as soon as possible. 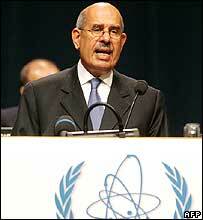 Speaking at the opening of the IAEA's annual conference in Vienna, Mohamed ElBaradei said talks could "address the international community's concerns about the peaceful nature of Iran's nuclear programme, while on the other hand addressing Iran's economic, political and security concerns". Mr ElBaradei said he remained hopeful that such talks would create the conditions to "engage in a long-overdue negotiation that aims to achieve a comprehensive settlement". 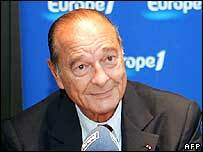 Meanwhile, Mr Chirac was preparing to go to New York, joining other world leaders for the UN General Assembly. Iran's nuclear ambitions are expected to be a key topic of discussion at the meeting, along with the situation in the Middle East, especially Iraq. US President George Bush is due to address the 192-nation assembly on Tuesday, where he is expected to further outline his vision for fostering democracy in the Middle East and the role the international community should play in the region.